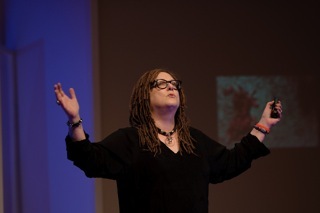 Diane Gromala spoke at TEDx American Riviera November 11 on Curative Powers of Wet, Raw Beauty. According to the TEDx website, her talk explores the wild side of mindful by creating provocative otherworlds. These virtual reality worlds enable people to access their own curative power in ways that have been measured as an effective non-pharmacological analgesics. Gromala’s work signals one way to address the so-called “silent epidemic” of chronic pain that affects 1 in 5 people — without resorting to the millennia-long use of opioids. A video of her talk can be found here. The Transforming Pain Research Group, led by Dr. Diane Gromala, will be showing off their stuff at the University of California (Los Angeles) Art | Sci Center + Lab on November 30. Others taking part include Andrea Zeffiro, Tyler Fox and Jay Vidharthi. Why is a media technology immersive VR known as a non-pharmacological analgesic? Can a robot reduce anxiety? How might novel forms of social media combat the social isolation experienced by seniors who have chronic pain? What do Sufi practices and phosphorescent creatures have to do with pain? 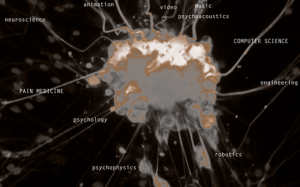 Members of the Transforming Pain Research Group comprise artists, musicians, computer scientists, engineers, designers, psychophysicists; and pain physicians. All are exploring the ways that new technologies may help the 1 in 5 people who suffer from chronic pain. Referred to as the silent epidemic, this relatively new disease has no known cause and no cure. While health care researchers explore its etiology, experts from diverse disciplines are working on ways to help with managing chronic pain. See what a group of innovative researchers north of the border are doing. Lab members Diane Gromala and Terry Lavender attended (via Skype) a Mindfulness Technologies Workshop, held at the Ontario College of Art and Design (OCAD) on November 18. Gromala gave an introduction to CPRM & the lab and discussed immersive virtual reality & mindfulness; while Lavender presented his proposed research on portable mindfulness: immersion and meditation on smart phones and tablets. Other topics included the effects of mindfulness on pain in adolescents; the effects of mindfulness on pain in adolescents and mindfulness technologies: work in progress. The workshop was organized by OCADs Mobile Experience Lab (http://mobilelab.ca/). Lab members Mark Nazemi and Amir Ghahary will be bringing their Mount Qaf multimedia performance installation to SIGGRAPH Asia 2011 in December. The piece s an audiovisual performance installation and a spatial/temporal structure which expresses the aesthetic dimensions of Sufism and electronic music culture. The experience combines generative digital art based on animating Persian patterns with eastern architectural motifs including Muqarnas, in syncopation with an ethnic electronic soundscape encountered through multi-channel acoustics. By re-imagining the traditional aesthetics of Sufism through the lens of electronic art and digital culture, the visual music journey of Mount Qaf sacralizes a nostalgia for the ancient past as well as reverence for an expectant technological future. Nazemi and Ghahary will be travelling to SIGGRAPH Asia, in Hong Kong, in December 2011. Physiotherapist Angelica Reeve visited our lab on November 7, 2011, and went for a walk in our virtual forest. On November 4, the Transforming Pain group threw open the doors to the pain lab as SFU Surrey celebrated the official opening of Podium 2, the newly expanded part of the campus, where the Pain Lab has now moved. Tyler Fox acted as MC for several groups of politicians, senior administrators, potential students and their parents, while Meehae Song demonstrated the virtual walking meditation application and Jay Vidharthi demonstrated the sonic cradle. Meehae Song co-led a 6-week Chronic Pain Self Management Workshop (Sep. 17- Oct. 29) through the University of Victoria at the Glenn Pine Pavillion in Coquitlam for 13 people living with chronic pain.